The sea turtle is an amazing creature. They can live for over a hundred years. A female must reach ten years of age before she can lay eggs, and then she returns to the beach where she was born. It is normal for her to lay as many as a hundred eggs. Out of that a few survive. Mexico is famous for being the sea turtle capital of the world – a place where literally, almost every sea turtle species on earth nests on its beaches. That is why the manner in which Mexico protects its sea turtles is important on a global scale. Tourism has a positive and negative impact on sea turtles. The big resorts add, “turtle release” to their menu of activities, some, with little regard for the survival of the turtle. Newly hatched turtles do not survive long, waiting for a tour group. The positive part is an opportunity to learn about these amazing creatures, and gain an understanding of their habits and habitat. 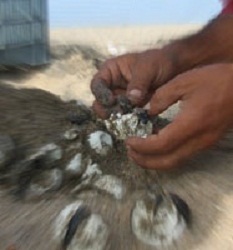 In addition to exploitation, and natures dangers, the turtle is faced with poachers who take eggs from nests on the beaches… considered a delicacy by some. 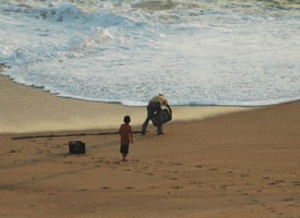 The trip out to sea may be met with fishing nets, and their long journey across the ocean from the beaches of Mexico and elsewhere, is full of hazards and pollution. Only the fortunate and hardy survive to return year after year to lay their eggs. This is why it is important to support the effort of those who truly protect the newly hatched for release into the ocean as they begin their new shot at life. Only a few understand what is involved and for them, it is a catch 22… to leave nests to poachers on deserted beaches, or gather eggs and protect them until hatching. Or, the fate of the turtle that returns to her “beach” only to find a mega resort with a tour group waiting for her. As a tourist or traveler, it is a special thing to witness the life cycle of the turtle. If you have an opportunity you should do so. Ask questions, and only support – donate or pay a fee, to those who actually follow through with what they are telling you, and are passionate about the preservation of turtles. Turtle release is not a tourist attraction; it is about protecting and preserving the sea turtle. The beaches south of Puerto Vallarta and Cabo Corrientes along the coast of Jalisco are major nesting grounds for turtles. Many of these pristine virgin beaches are designated turtle sanctuaries. Our beach is one of those and our friend Casi is one of the passionate individuals who dedicate much of his time to protecting turtles. Over the last three or four years, he has incubated and hatched for release, thousands of baby sea turtles. An effort that I support with encouragement and donations.